Job (Arabic: أيّوب Ayyūb‎‎) is considered a prophet in Islam and is mentioned in the Qur'an. Job's story in Islam is parallel to the Hebrew Bible story, although the main emphasis is on Job remaining steadfast to God; there is no mention of Job's discussions with friends in the Qur'anic text, but later Muslim literature states that Job had brothers, who argued with the man about the cause of his affliction. Some Muslim commentators also spoke of Job as being the ancestor of the Romans. Islamic literature also comments on Job's time and place of prophetic ministry, saying that he came after Joseph in the prophetic series and that he preached to his own people rather than being sent to a specified community. Tradition further recounts that Job will be the leader in Heaven of the group of "those who patiently endured". The narrative goes on to state that after many years of suffering, God ordered Job to "Strike with thy foot!". At once, Job struck the ground with his foot and God caused a cool spring of water to gush forth from the Earth, from which Job could replenish himself. The Quran states that it was then that God removed his pain and suffering and He returned Job's family to him, blessed him with many generations of children and granted him great wealth. In addition to the brief descriptions of Job's narrative, the Quran further mentions Job twice in the lists of those whom God had given special guidance, wisdom and inspiration (IV: 163) and as one of the men who received authority, the Book and the gift of prophethood (VI:84). After Satan has given up trying to turn Job away from the Lord, God removed Job's affliction and returned his family to him, doubling them in number. He returned Job's wealth and showered Job with gold. Once Job's wife had seen her husband restored to prosperity and health, she prayed thanks to God but then worried over the oath her husband had taken earlier, in which he had promised to beat her with a hundred strokes. Job was also deeply grieved over the oath he had taken, amidst his suffering. God, however, sent a revelation to Job, which told him to not beat his wife but to gently hit her with a bundle of soft grass. Ibn Kathir narrates the story in the following manner. Job was a very rich person with much land, and many animals and children — all of which were lost and soon he was struck with disease as a test from God. He remained steadfast and patient, so God eventually relieved him of the disease. "That was the reasoning about Us which We gave to Abraham (to use) against his people. We raise whom We will in degree, for thy Lord is full of wisdom and knowledge. We bestowed upon him [Abraham] Isaac and Jacob, all (three) We guided; and before him We guided Noah and among his progeny David, Solomon, Job, Joseph, Moses, and Aaron. Thus do We reward those who do good." Muslim historical literature fleshes out Job's story and describes him as being a late descendant of the patriarch Noah. 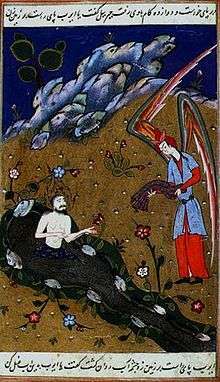 Similar to the Hebrew Bible narrative, Ibn Kathir mentions that Satan heard the angels of God speak of Job as being the most faithful man of his generation. Job, being a chosen prophet of God, would remain committed in daily prayer and would frequently call to God, thanking God for blessing him with abundant wealth and a large family. But Satan planned to turn the God-fearing Job away from God and wanted Job to fall into disbelief and corruption. Therefore, God allowed Satan to afflict Job with distress and intense illness and suffering, as God knew that Job would never turn away from his Lord. Although Job's possessions were destroyed and he suffered many calamities, he remained steadfast in his worship of God and remained committed to his religion. Satan then appeared to Job in the guise of an old man and suggested that God was not rewarding Job for his prayer. Job, however, rebuked Satan and told him that God is all-knowing and does what He thinks is best. It is said that then Satan, having failed at tempting Job, turned to Job's wife, who was also a faithful woman. Satan reminded Job's wife of her life before Job's affliction and how they were abundant in family and fortune. Job's wife, although she did not lose faith, burst into tears and asked Job to tell God to remove this suffering from the household. Job, in his misery, rebuked his wife and told her that this suffering had been for a relatively short period of time and, without thinking, told her that he would beat her with 100 strokes for complaining. The entrance to the cave where Prophet Ayyub (Job) went through his ordeal with illness, Urfa, southeast Turkey. ↑ Brandon M. Wheeler, Historical Dictionary of Prophets in Islam and Judaism, Job, p. 171. ↑ Ibn Kathir. Stories of the Prophet. 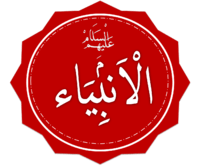 Mansura: Dar Al-Manarah. pp. 157–9. ISBN 977-6005-17-9. ↑ Ibn Kathir states in Stories of the Prophets: "Ibn Ishaaq stated that he was a man of Rum. His name was Job, son of Mose, son of Razeh, son of Esau, son of Isaac, son of Abraham."